Definition: ASOM is an acute inflammation of the mucosal lining of the middle ear cleft (middle ear, Eustachian tube and mastoid air cells). The nose: (Sinusitis, acute rhinitis). The nasopharynx (Adenoiditis, nasal pack, vomitus, milk regurge). 2. Through a drum perforation (swimming and bathing). Viruses play a role paving the way for pyococcal invasion e.g influenza and exanthema. Stage of Eustachian tube obstruction (Tubal catarrh): Oedema and congestion obstructing the Eustachian tube. Air gets absorbed from the middle ear with failure of Eustachian tube opening to equalize the negative pressure. 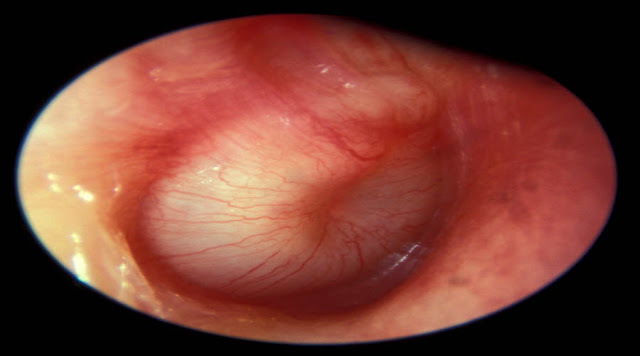 Stage of acute catarrhal otitis media: congestion and oedema of the middle ear mucosa with serous exudation. Stage of suppuration: The exudate becomes mucopurulent and pus accumulates under tension. Stage of perforation: Necrosis of the drum causes perforation. Incidence: more in infant & children. Pathology: Tubal obstruction due to congestion, then air is absorbed. Prominent lat. process of malleus. Pathology: Oedema & congestion of ME & serous exudate. T.M is congested with prominent vascularity, lost cone of light. Pathology: Pus accumulates under tension. T.M is congested markedly & bulging with lost cone of light. Pathology: Necrosis of part of T.M. General symptoms start to subside. Perforated T.M: usually anteroinferior, if large ME mucosa appears congested. Systemic antibiotics, for 10 days. local antibiotic drops or warm glycerin phenol to decrease edema &pain. Failed medical ttt for 48 hours. Bulging T.M (pus under tension). Complications. -Immunosuppressed patients,for fear of complications. Infants and children (don’t wait for bulging to occur). Antibiotics according to Culture and sensitivity. Myringotomy if perforation is small or high. Cure: middle ear mucosa & hearing return normal. Chronicity: suppurative or non suppurative.